Many people in Velebit are curious about why our family is so passionate about beekeeping and why we want to make our family honey business professional full time jobs. Like for many other entrepreneurs, the answer for us is simple. We started to explore bee keeping six years ago when my husband, Sanjin, designed and installed four bee hives next to our house in the beautiful coastal village of Senj in Velebit, Croatia. He was driven by his love of nature and bees, and was also curious to see if he could produce his own honey. A lot happened in this very first year with many mistakes, but also with many small achievements that ignited our passion for beekeeping. Sanjin became so attaracted to the busy bees that he would even circle the hives at night with a flashlight to watch their behaviour before coming in and telling me what they were doing. His excitement was a great joy for me to witness. We started to collect literature and read books about beekeeping in Velebit and in the Mediterranean. Slowly but surely I became just as excited as Sanjin. During this period Sanjin was unfortunately diagnosed with diabetes caused partly by stress from his professional job. Amazingly, we found out that his health improved when he was doing beekeeping. His love of being in nature and doing physical work partly alleviated his condition. It was clear to us that his life had to change so we decided to invest funds and purchase more equipment and forty beehives. Together we renovated the hives by repairing damaged woodwork and painting each of them. After a while bees in the hives started to produce honey which we sold in Velebit. We loved working and spending time together and realised this was a great opportunity to change our lives. Gradually, the whole family became involved in the beekeeping and honey production, each helping in their own way. Our two young children have grown up with bees as an important part of their lives. They love bee keeping! Our family is so happy to live on the coast surrounded by the spectacular untouched nature of Velebit and the Adriatic. The various open lands and valleys with wild flowers for the bees to collect pollen are perfect for bee keeping. 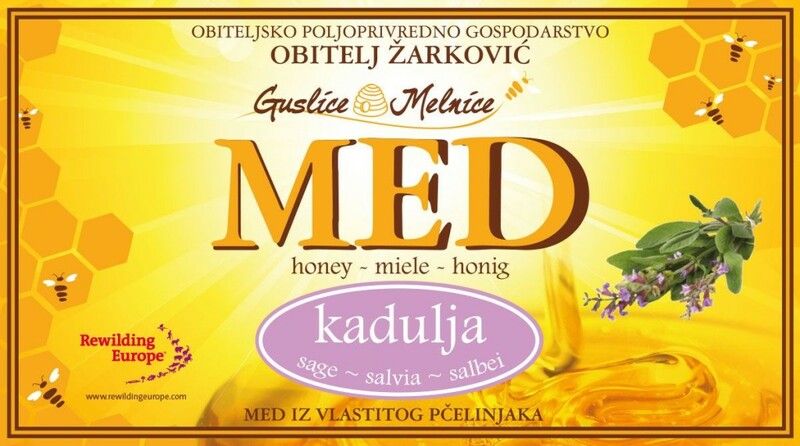 Guslice and Melnice now produces both regular and sage honey. The sage grows in meadows in the heart of the northern Velebit, where some of our hives are located. The honey is a rich golden colour and very aromatic from the wild mountain herbs that make Velebit honey taste so special. For us it is extremely important to preserve these natural areas and beautiful landscapes. Sanjin has realised this and as President of the Senj Beekeeping Association has attracted beekeepers from all across the area to work together in ensuring we are sensitive to nature and always work to protect it. We realise that the bees, threatened by factors such as pesticides and pollutants, may not survive without our support. Over the years we have found beekeeping to be a rewarding but also highly challenging business. The climate conditions in Velebit can change very quickly and the seasons are not as regular as before. Realising this we decided to make our product range to be less vulnerable to weather conditions, but we needed a loan to do it. During a community meeting here, organised by Rewilding Europe, we found out a great opportunity for our business. They not only offered to us financial help and a loan, but also provided us business advice and promotion. We drafted a business plan outlining our ambitions to expand the Guslice and Melnice company and to develop new products, including several types of honey, breeding queen bees and collecting bee venom (which does not harm the bees) for use in the medical industry. After several meetings with the Rewilding Europe team, and adjusting our business approach with help from their advice, we successfully secured a €30,000 loan from their investment branch, Rewilding Europe Capital. With pride and great enthusiasm we have now become part of the rewilding family and they are now a welcome part of ours. We received the first part of the loan, which has been used to purchase new equipment, beekeeping containers, a device for collecting bee venom and increasing our number of bee hives. The future will of course bring lots of hard work for us, but we are not afraid and we are looking forward to our lives as professional beekeepers. Continuing the family business together with Rewilding Europe is very important to us.